As a marketer, it’s sometimes easy to feel like the stereotypical secretary making coffee for the boss: as though you’re just the services arm for the sales team. With Marketing’s mandate often driven by sales or by product management, that’s a typical perception in many B2B organizations (along with “marketing is easy, anyone can do it”). If we allow those perceptions to persist, we become nothing more than reactive order takers executing the campaign du jour. It’s up to you to take back control of your own destiny. Here are some tips for shaping your Demand Factory by making your marketing operations more strategic. Without specified targets and goals, it becomes very difficult to defend your position as a strategic part of the organization. The more you sit back and let others bring you campaign requests, the less control you have of reaching your objectives. 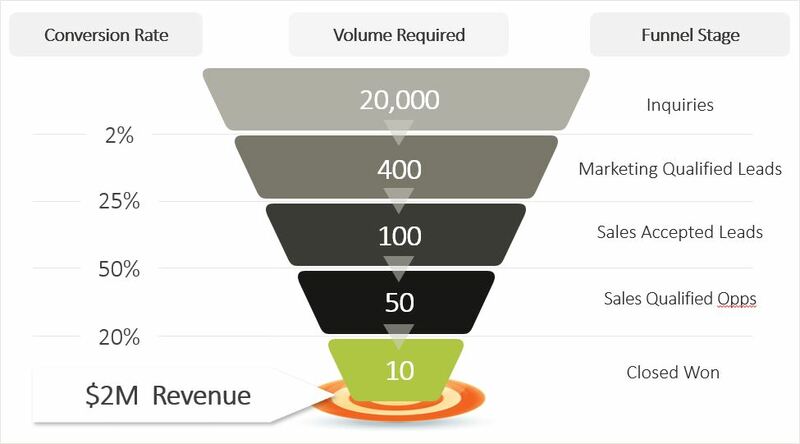 For many teams, this may seem dead obvious, but I am still surprised today by how often marketing leaders tell me they have no targets, not even a count-of-qualified-leads target. Understandably, some of us are reluctant to commit to targets, because we now have to be accountable for them. Without them, however, how do you truly measure success? If your team doesn’t have targets, create them yourself. 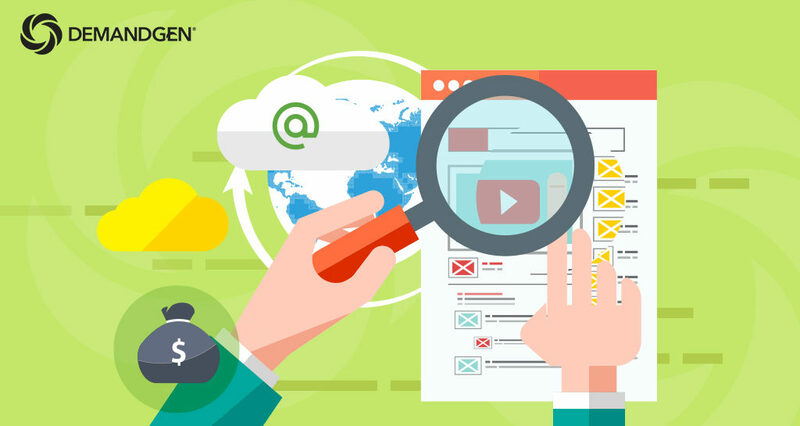 Analyze your historical metrics and devise targets that align to corporate strategy and business outcomes – your target numbers should have dollar signs in front of them (e.g., aligned to pipeline and revenue targets), sometimes percentages (such as conversion rates), and almost never counts. For example, measuring a count of qualified leads is important, but it’s more informative as part of a conversion rate calculation. This is a journey, so don’t expect to get it right the first time, and do expect to have to justify your numbers. The better you become at tracking and benchmarking, the more accurate your targets will become. Here’s a quick example in calculating targets using the benchmarks in the image above: Let’s say you have last year’s metrics as above: Marketing sourced $2M in revenue, which was 20% of the overall revenue attained. This year, the revenue target is increased from $10M to $15M, which means marketing now needs to source $3M in revenue. Assuming all other metrics stay the same and working the conversion rates backward, we need to nurture and qualify 600 MQLs and contribute $30M to pipeline: our new annual targets. You will still need to respond to the needs of the business, but there’s a difference between being an order taker and being a trusted advisor to your colleagues across the various functions. Demonstrate your interest in breaking down silos and developing effective partnerships. Reach out to your cohorts in sales and products to develop a shared definition of an ideal customer, understand their targets and roadmaps, and devise a concerted approach. Come to the table with key insights on what’s worked well in the past and help your colleagues to align their programs and validate your targets. 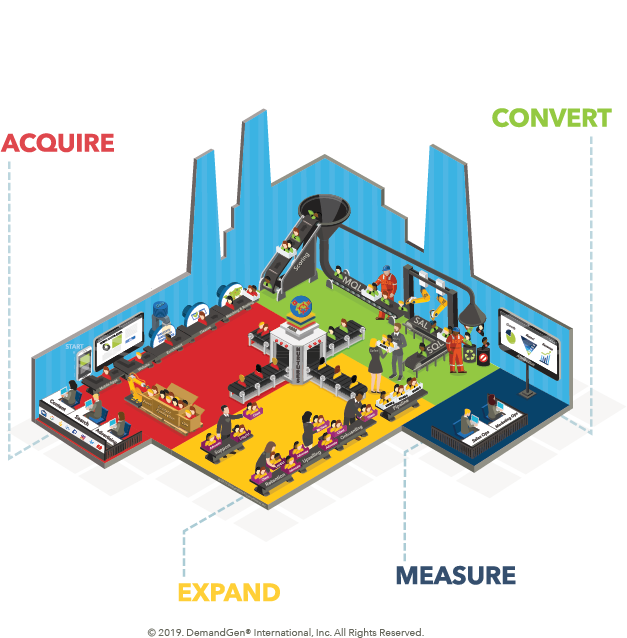 The four areas of the Demand Factory – acquire, convert, expand and measure – provide a strong framework for success because they apply to the entire customer journey and therefore all parts of the business. Effectively generating demand relies on the contributions of all parts of the business; the whole of the Demand Factory is greater than simply the sum of its parts, as seen in the infographic below. Once you have targets, it becomes possible to devise a plan to achieve them. You’ll need to answer many questions as you create your roadmap: What marketing programs will we need to meet our customers’ needs? What processes must be developed and deployed? What skillsets are required to support these efforts? What technology will supplement these processes? What data is needed and where does it live? 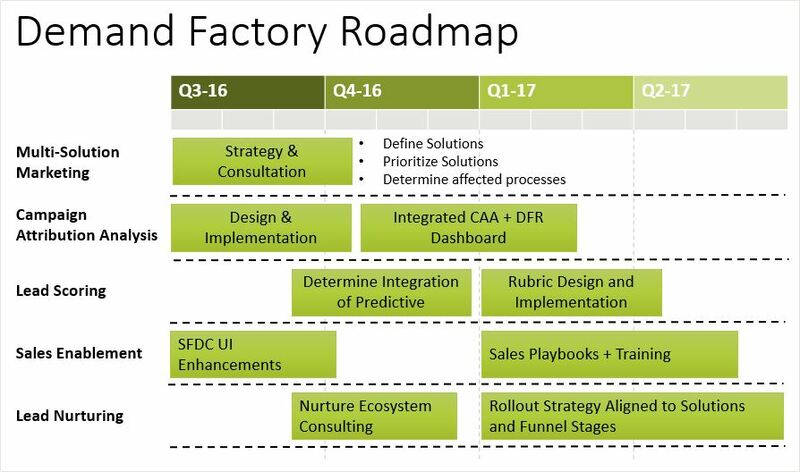 Your roadmap for working toward your marketing targets will ultimately become the blueprint for building your Demand Factory. Your plan may become overwhelming quickly. We’d all love to have unlimited budgets, resources and time, but the reality is that you’ll need to develop a phased approach to your plan: a roadmap. Many sales-driven organizations think fairly short term, quarter to quarter, even though the business may have 3-, 5- or even 10-year corporate strategies. As seen in the example roadmap image below, developing a one-year (or longer) marketing roadmap shows strategic, long-term thinking and better alignment with the overall business. Do revisit your roadmap on a quarterly basis not only to demonstrate progress but also to ensure that it’s still in sync with the overall corporate strategy. As your marketing operations practice matures over time, with this approach, your stakeholders will look to you for guidance on how to achieve goals, rather than telling you your role in executing on their plan. Foster those internal relationships, execute on an aligned roadmap, demonstrate mutual success, and you’ll find you have a reserved seat at the strategic planning table. If you would like to learn more about the demand factory check out our whitepaper, Make Marketing Matter, or drop us a note! Gaea Connary, Director of Consulting Services, focuses on helping organizations strengthen their lead management processes, lead scoring, nurturing strategy, and reporting and analysis to get the best return on their technology investment and meet their marketing objectives.